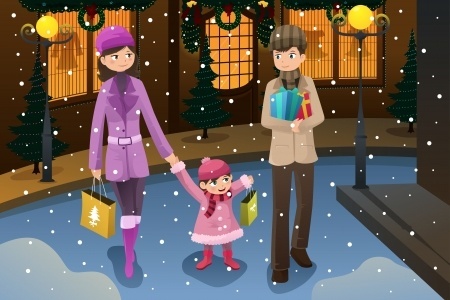 … is a simple service, close to Christmas Day, for small children and their families / carers. Parents / carers can bring their little children without fear that any noise they might make will upset anyone – because we know that they'll wriggle, sniffle, laugh and maybe even cry, and we'll enjoy it! It is a short, noisy, fun service, that engages the children by looking at and thinking about the characters in a Christmas Nativity scene. We mix in Bible readings and a couple of traditional carols to help the grown-ups hear about Jesus and sing his praise. … is at the heart of this service, alongside the crib and the characters from the true story of Christmas. 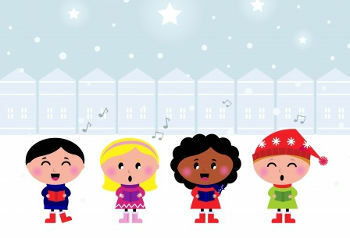 The song is easy for small children to enjoy, repetitive so they can learn it, and contains the important parts of the story. 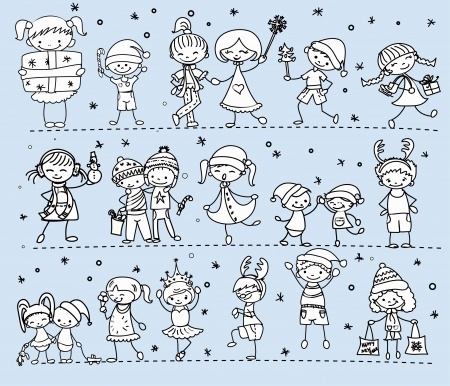 … is wrapped up as a “pass-the-parcel”, with a character in each layer, in exactly the right order. 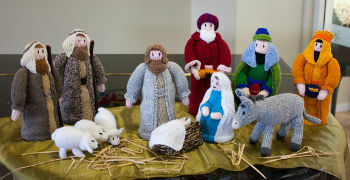 Our knitted nativity set was made by a church member, but the pattern is readily available, or sets can sometimes be bought on ebay. This way, the first layer to be unwrapped is Mary. … is set up at the front of the church where everyone can see it. We actually have two 'cribs': a large one at the back of church, with model figures, that can't really be played with by the children, and a homemade cardboard portable stable of a very simple design, which is used in this service. It is made at the same scale as the knitted nativity set, which will end up placed in front of the stable. We have video screens, so we have a video camera aimed at the portable stable to show the action. That's optional - just make sure you have the stable on a table high enough for people to see it, or somewhere central. 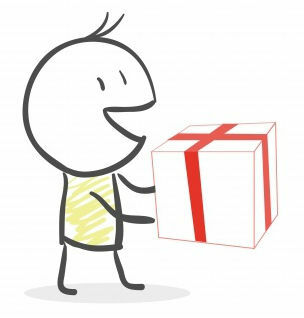 … is “Pass-the-parcel.” The parcel is passed around the church while some music is played. When the music is stopped (at just the right time) the nearest child opens one layer to reveal the next Nativity character. For some stages in the story this has to happen two or three times (eg twice for Mary & Joseph, three times for the Magi). The child then comes to the front with the character and places it by the stable. Then you have a Bible reading and a few words about the story, and sing the next verse from the song, with actions. When that's done, there's more music and the parcel continues on its way for the next part of the story and its characters. With some careful intervention, you can get the parcel round the whole church once. We also have a bucket of sweets going round behind the parcel, so no child is left out of the fun. Children take characters to the front, place them in stable. … are listed below. They are really short. You'll be amazed at how quickly little children get restless during a reading, so they have to be really short. We used the Good News Bible to make them a bit more friendly to young ears. If you have a projection screen it would be worth showing child-friendly images (NOT old masters!) while you read the readings, to help the children to stay engaged. … complete the package. I do a short 5 minute talk (with a puppet) once all the scenes are completed to share the wonder of Jesus the Saviour being born. We sing “Away in the Manger” at the stage of the story when Jesus is born. We also sing a couple of verses of a carol at the beginning of the service, and another at the end. We try to chat with everyone as they arrive, and at the end of the service. Sing the chorus cumulatively – that is, after verse 2, sing chorus 2 and chorus 1; after verse 3 sing chorus 3, 2, 1 etc. Mary and Joseph knew Mary was going to have a special baby, but they had to travel to Bethlehem. Jesus was born – it was very hard for them: they weren't in a house, and the only place they could lay him down was a feeding place for animals. The Shepherds heard that Jesus the Saviour was born, they were very excited and rushed to find him. The Wise Men travelled for miles to see the new King Jesus and worship him. Let’s jump with joy for that little boy is going to be the Saviour of the whole wide world! with the Shepherds from the farms. Bowing right down to the King they have found. Song words by David Heath-Whyte, Copyright © 2012 Maynard's Groovy Bible Tunes. Used by permission. … or you can talk to a soft toy, who whispers answers in your ear! But that was years ago, what about today? Worship – we can still worship Jesus today, with our lives. Are you going to tell the Grown-ups about our Christianity Explained course? Christmas services can be quite stressful for whoever is leading. The key to this one is to relax, and let it flow along. Enjoy the children, respond to their reactions, joke with them, whatever. Show them that being a followed of this Jesus is something great, just because he is so great, and what happened at Christmas was amazing.